Working from home is not something common in China, a country where “being in the office” means “working”, when everybody knows that you can be in the office warming the chair and wasting time 8 hours a day. When I was in my previous job, I noticed that when the boss was away, the people in the office stopped pretending they were working, chatted aloud among themselves and left earlier than usual (as soon as the appropriate time to swipe their work card arrived). I have nothing against doing this if you really are not busy, but of course when the boss is present you have to pretend to be very busy so a) the boss doesn’t think the company could do perfectly fine without you and b) the boss doesn’t give you more tasks to do. 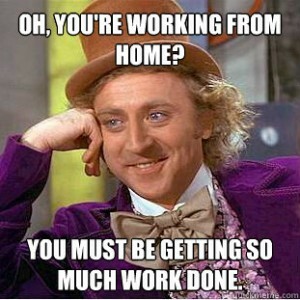 When I tell people that I work from home, some seem to think that I do nothing all day. Some friends seem genuinely surprised when sometimes I say I’m busy. I guess for some it’s hard to understand that some people work even when the boss is not looking! What some of my friends must be thinking. I’m able to work from home because the work I do is all based on deadlines and I work alone, as the only Spanish translator and tester in my company. Obviously, for positions that require to constantly manage people and attend meetings, working from home is not always possible (although I would argue that a good team can be remotely managed and most meetings can be replaced by emails or conference calls). I am not a freelancer, though. If I was a freelancer I could accept or reject the projects based on my circumstances and work in the evening instead of in the morning, if I wanted, as long as I delivered by the agreed date. However, as a full-time employee in my company, it is implicitly expected that I start work at more or less the same time as the people working from the office, because someone can suddenly need me to do something (we keep in constant communication via instant messaging). Even when I am not busy because we don’t have new projects, I sit in front of the computer most of the time, in case something comes up. It would be totally fine if I went out for a long lunch (and in a few occasions I’ve done it, after all, people in the office do it too! ), but I feel I need to prove that I am trustworthy by being completely available during work hours, as it is expected. I think working from home has shown me that I have a strong sense of responsibility and I do my tasks because I have to do them, not because someone is watching over my shoulder. In fact, yes. Much more than in the office, when apart from having a computer connected to the internet you also have chatty colleagues, office drama, meetings and a kitchen full of snacks. 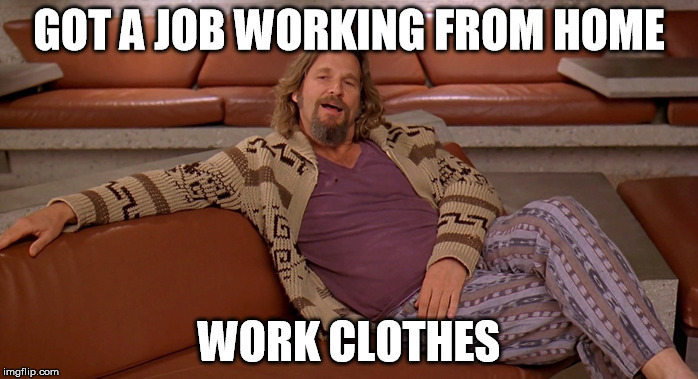 And, in case you were wondering, no, I don’t work in my pyjamas! I take a shower in the morning and change into stay-at-home clothes (usually, old clothes I don’t wear to go outside anymore). Working from home not only saves you commuting time and money, but also clothes-shopping time and money! This meme is actually true, hehe. 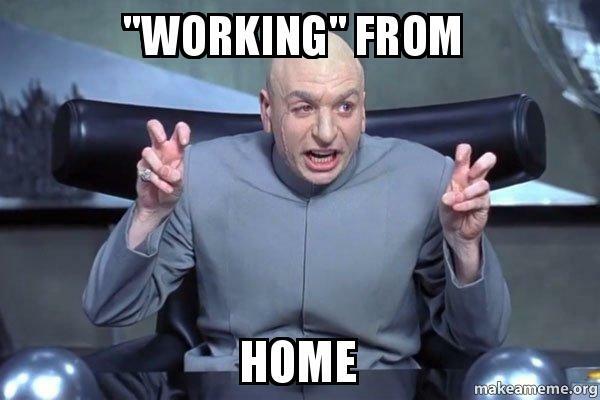 Have you ever worked from home? What did you like and dislike of it? If you never worked from home, would you like to if you had the chance? In my current job, we have so much work to do that nobody needs to pretend anything. I think it is also because we got deadlines and we are evaluated by results. It does not really matter for me if my boss is around me or not. In fact, everyone in the team is encouraged to work from home one day per week. I am very happy about the level of trust we get. Great article! When my daughters were young, I worked in advertising sales from a home office. You are ABSOLUTELY correct in stating that if you have deadlines, you are driven by those deadlines, so even if you take a break during the day to do a personal errand, you will work longer in the evening, but you are driven by the deadline you have to reach. I found that when I worked at home, I worked harder, because I felt like I had to PROVE that even working at home, I could achieve results! When I missed “people” I would go into the office for a few hours and/or set up appointments with customers. It was a wonderful way to work, especially with small children. It allowed me a lot of flexibility! I work from home full time! The office is in Shenzhen! :D I only go there like once a year… I guess they believe I’m working, as it’s been like this for over 2 years. I did work for a year in-house for this company, when they had a Shanghai office, so they got to know and trust me during that time. I really enjoyed this article, largely because I’ve only recently had the option of working at home here and there. Now, in large part, there’s no option for this. I teach, I help manage a small team – we’re a training center, so there’s no option for that. But as I do a lot of our marketing, too, I can do overtime shifts, etc. from home. And I struggle a lot with it. When I’m home, it’s so hard to get myself out of bed or off the couch, and to stay focused at my desk. My laundry needs to get done! That bookshelf looks disorganized! What about that dingy bathroom! I lose focus so easily. This all makes me worry a lot about being a freelancer – something I may try to do when we move to our next country in a year or two. Will I be able to handle it? But I appreciated your perspective – and your hidden tips within the story. So thank you for sharing! Haha! I’m quite messy so I don’t care much about the laundry or the bathroom. But, if I’m not busy, I can use that time to work around the house or cook. When I have things to do, I don’t find it hard to just forget about external things. You could try some tools like Pomodoro, which counts segments of 25 min of working time and 5 minutes of rest, and during those 25 minutes you just focus on the work at hand. If procrastinating on social media is a problem, there are some tools that keep you from opening those websites (I haven’t felt the need to try them for now). I think being a freelancer/working from home teaches you about being responsible for yourself! Nice post, Marta. Working from home is fine and in some cases, can be even more effective since you might have less distractions and noise going around you. And since you have to maintain the same hours as your colleagues, you are working just as hard, if not harder, as them. My old workplace in HK was similar in that people would often spend a lot of time joking and chatting when they were idle (Asians may have long office hours but not all of that is work, ha) and it was very distracting at times. Yeah, I remember the hair salon in Beijing I went to had staff holding the door for customers, people at the counter handling money, people washing hair, and the actual barbers. I telecommuted from a home-based office for 18 years and loved it. Like you, I always made sure I was by the computer during standardwork hours — if anything I was MORE diligent than if I’d been physically in the corporate office, as I wanted to make sure management and my team knew I was really working. It made the whole work-life juggling act actully doable, especially with two school-age kids. And, on conference calls (which happened 2-3 times most days) I could quietly hit the mute button on my phone headset and get something else done while listening with half an ear to the phone :-) I’d fly out to corporate HQ for a couple of days every month or two (800 miles each way), and spend two days reminding everyone that I existed; the rest of the time my “commute” took about 30 seconds every morning. There were people back at HQ who for years didn’t even realize I was 800 miles away, since most of the communication in such a large company was done by phone and email anyway. Thoroughly recommended as a great way to work — tho’ not for everyone. I had one colleague who flatly refused to ever work from home, since he craved face-to-face human interaction too much. Me, I loved it! I can imagine that with kids it is very convenient working from home. I go to the office once a year or so because it’s really not needed… also, it’s a 2 hours flight. Being on instant messaging with everybody allows me to chat easily with them, but with some people you really need to talk to them face to face, haha. Luckily I rarely have phone meetings nowadays. Nice article, I worked from home for alomost 1.5 yrs. You are absolutely right about the perception of people about working from home. I think those same people would probably be the ones who wouldn’t work much if they were at home… and maybe they often slack in the office too! I work from home. Sometimes I miss human interaction. At least I have Twitter? I never understood Twitter, haha. Just can’t see the point. Well, one less social media addiction I have to worry about! I think it’s fantastic for writers and political activism and breaking news. On occasions I have worked from home but my job required me to be in the office or out and about investigating (police officer so not good if I am not seen) but towards the end of my career I had an office job so I have taken a few days here and there if I needed to be at home and worked on the computer. Good article as always Marta. I love the memes you chose, so perfect. I could see why the Chinese think this way. I think with older generation especially they feel this way. My goodness, try doing something creative like being a fulltime artist or writer or even being a freelancer – so stressful to make money! Forgetaboutit. :P But good for you. I couldn’t do it. I’m too much of a homebody. I need an excuse to get out of the house. PS: My excuse to get out of the house is my dog, hahaha. Hola Marta! Muy buen post. Yo también me siento identificada con la última parte del pijama! me pasa lo mismo, aunque a veces me toque trabajar desde la casa si o si me ducho y me visto como corresponde. No se por qué pero no soy del tipo de persona que usa pijama todo el día incluso si es domingo o feriado o día de pereza. Siempre me pongo mi ropa, me siento incómoda con el pijama todo el día jaja. Yo tampoco estoy nunca en pijama todo el día! No puedo vivir si no me ducho como muy tarde antes de comer, y claro si me ducho me cambio de ropa jajaja. Haha I love these memes! I can totally relate! I just got a job where they let me work from home almost all the time. I am also completely independent. I enjoy the freedom and flexibility, but like you say, all my friends think I’m just goofing off all day. I actually get more work done at home because there are less distractions. I’m also waiting around for people to message me during work hours too. Relate to so many things on here! I don’t feel lonely, but it’s true that I am alone all day. For the moment I’m fine with having social activities only in the evenings or on the weekend! Regarding team work, I am very picky and perfectionist so I have to confess I prefer working alone… unless I can get to choose my team members, hahaha. I hate slackers!